Today, LEGO introduced a new series of interactive building block games called LEGO FUSION that combine traditional physical play and app-based digital play. 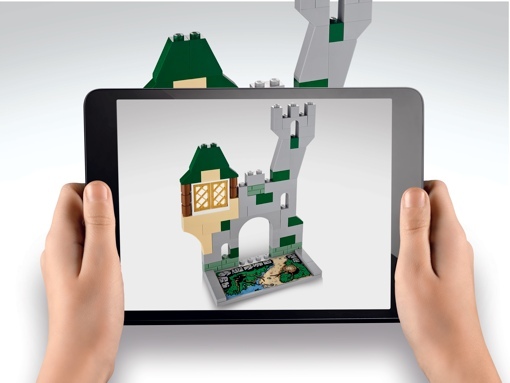 Each of the four LEGO FUSION titles – Town Master, Battle Towers, Create & Race and Resort Designer – comes with its own unique set of bricks and a free downloadable smartphone or tablet app for iOS and Android devices. Creations are first built in real life on the included FUSION capture plate. Once finished, a mobile device is used to capture a photo of it, allowing the structure to be uploaded into the virtual LEGO game world. The real-world design aspects of each of the four games aren’t just for show. Success in each game will require your child to revisit, rebuild and upgrade their physical creations. In the racing game, for example, small changes to the real-world car will affect the vehicle’s performance in game. In the tower defense game, kids can repair in-game damage by rebuilding their real-world structure. LEGO FUSION Town Master, Battle Towers and Create & Race will be available at Toys 'R' Us and at shop.lego.com starting August 2014; the beach-themed Resort Designer game launches in September. Each kit will cost $34.99. For some virtual LEGO fun in the meantime, check out Google's free LEGO model builder app for Chrome and the LEGO City Undercover game for the Wii U.